The Peabody Parklet is a pop-up installation that can be reconfigured into any shape/space for community events. For this event, and a budget of less than $25, we created a canopy out of bubble wrap and lit it from below with uplights. The same effect could be achieved with paper or fabric, but in this case it needed to be weatherproof and reusable. Capturing the Arc is on display in the atrium of the Museum of Science, Boston. It is comprised of 27 acrylic arcs, etched with small dots in a grid. LED lighting lines the perimeter of each arc, and when lit, the arc appears solid. When not it, it appears clear. The large surface to weight ratio allows the arcs to rotate freely in the breezes of the lobby. The colors change continuously and can be customized on the fly. A neurohealth and neurofitness center in Scottsdale, AZ contacted us to design and install the lighting for their multi-sensory fitness and recovery experience. From the lobby to the sports performance enhancement rooms, every area was bathed in colored light. This loft featured 11' ceilings and presented the challenge of properly lighting the living area without having large diffused pools of light. Several optical MR-16 bulbs were used in cable lighting suspended below the actual ceilng for both accent and ambient light. The purple suspended fixture above the dining table is a George Nelson Bubble Lamp that was retrofitted with 12" LED cove fixtures, which allow the user to change the color into anything he or she can imagine. The cable lighting around the perimeter of the table eliminated the need for a traditional chandelier. The lighting in this room was specifically designed to highlight the artwork and fireplace material, but create a dark area in the firebox for maximum enjoyment of the flames. Color-changing LED lights were inserted into off-the-shelf storage cubes. The lights can be programmed for any number of effects. These cabinets showcase the individual color control offered by LEDs. LEDs are a natural fit for cabinets. Their low energy consumption, insiginificant heat output, and small size allow them to enhance any enclosed space, however small. These cabinets are faced with frosted glass, but clear glass also creates a pleasing effect. The lightwall is made of 20 LED cove fixtures set inside a custom fabricated grid of wood and aluminum. Glass sheving attached to the grid allows he wall to be completely reconfigured for any occasion. In this shot, the wall is set for a Christmas party. Each square can be individually controlled to create any color the user desires. 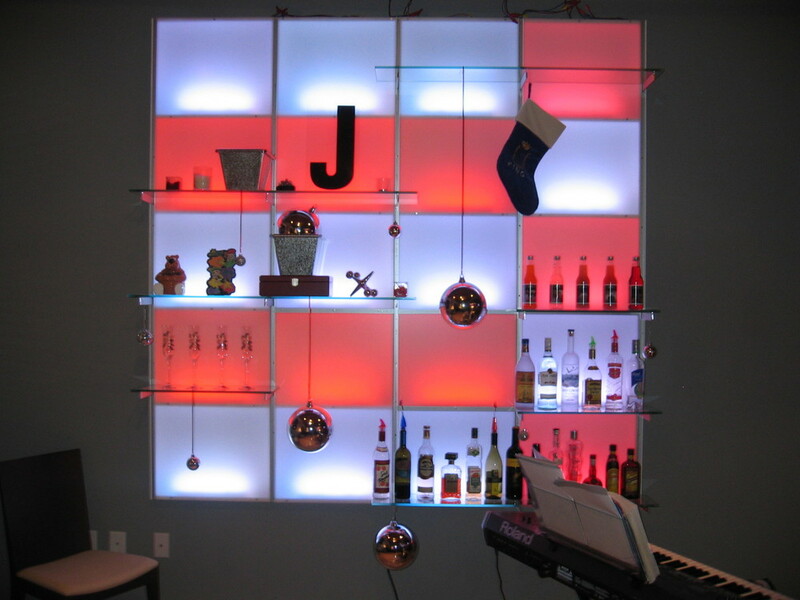 This installation was made of LED towers affixed to the front of wooden shelves. Each tower had 6 individually addressed LED fixtures, allowing the user to create custom patterns and transitions. The residence shown here is completely lit with LEDs. With every light in the home turned on to full power, the house consumes approximately 750 watts of power, less than half that of a hair dryer. Under most conditions, the total power consumption is around 150 watts. The colored lights are changeable to whatever the user desires, and can also run programs. ©2017 Retonica. Photography by Retonica & Social Palates Photography. Web Design & Branding by Figsburry Creative Group.